Ada Diamonds, Inc. accepts same-day bank wires, credit cards (Visa, Mastercard, American Express, and Discover), Bitcoin, and 12-month financing for U.S. residents in select states via Square and Affirm (up to $10,000 USD). Payments made by automated clearing house (ACH) or e-check are only allowed for deposits and are not valid for final invoice payments. Ada Diamonds does not accept personal checks, even checks mailed directly from a customer's bank. For in-person sales at our San Francisco location, or at an Ada Diamonds' trunk show, cash is also accepted. Ada Diamonds uses three different online payment systems including Stripe, Square, and Intuit. Some transactions may require same-day bank wire as the only form of payment. You may be asked to provide government-issue photo identification at the time of payment. International clients may be required to show a copy of their passport in compliance with The USA Patriot Act. Ada Diamonds, Inc. reserves the right to reject a transaction for any reason, including but not limited to fraud risk, insufficient funds, or suspicious activity. Final invoices may only be paid via credit card or same-day bank wire transfers. In the case of bank wire, all payment fees are the responsibility of the customer. In order to reserve a lab diamond, or begin the custom design process, a fully transferable but non-refundable deposit is required. Should you change your mind, the non-refundable deposit may be applied towards another diamond or piece of fine jewelry. This deposit is designed to show your seriousness towards completing a custom piece of fine jewelry with Ada Diamonds, and is also designed to discourage placing deposits on multiple stones at multiple retailers. Should you not be satisfied with your purchase, your non-refundable deposit may be fully refunded through our 30-day return policy on a finished piece of jewelry. Prior to the start of creating a bespoke piece, you will receive a cost estimate for the entire piece(s) of jewelry, which may require your signed approval. Within 24 hours of placing a deposit on an in-stock or commissioned lab grown diamond, you may cancel your order and receive a full refund. After 24 hours, deposits are subject to the aforementioned refund policy. Ada Diamonds purchases diamonds from major growers around the world, and our Diamond Concierges inspect each stone for quality prior to selling to a client. . A Concierge may need to bring in a diamond on memorandum for a specific client. While we aim to offer this as a complimentary service, Ada Diamonds may require a transferable, but non-refundable memo fee to bring in multiple stones for a single client request. Ada Diamonds will notify the client of this memo fee in writing prior to any transaction commencing. Memo periods can be limited to as little as 24 hours. Ada Diamonds cannot guarantee reservations of a stone without a 20% deposit. Our all metal wedding bands, Ready to Ship items, items from The Classics Collection, and loose diamond purchases carry no order minimum. Due to unforeseen circumstances outside of Ada Diamonds’ control, the signature Lavoisier process has been suspended indefinitely. However, the commissioning of a diamond cut from an existing rough crystal is an available option. A larger deposit, up to the full cost of the stone, is required to begin the commissioning of a diamond or multiple diamonds. Deposits on commissioned lab grown diamonds are non-refundable and all commissioned diamond purchases are final sale. Commissioned and custom cut diamonds are cut to client specifications. However, due to the nature of cutting gemstones from rough diamonds, Ada Diamonds reserves the right to adjust measurements and total carat weight within an industry-accepted variance yield of 10%. Commissioned stones may also be within 2-3 color and clarity gradings, which will be confirmed in writing prior to client payment. Shipments of loose diamonds, Ready to Ship items (including the Delicate Collection), and Strong Collection rings require full payment upon placing an order. Prior to the shipment or delivery of a completed bespoke piece of jewelry, full payment on the remaining balance of an invoice is required. You have 30 days from production completion to pay your final invoice; however your piece of fine jewelry will not ship until the final invoice has been paid. Paid for, finished jewelry will be held at no charge in Ada's secure facility for up to 15 days before shipment. Failure to pay for the finished piece of jewelry within 30 days of production completion may result in forfeiture of the deposit and cancellation of the order. Ada's 30-day return policy commences on the day of final payment. All prices quoted through the Concierge process, on Ada Diamonds' web site, at the San Francisco location, or at any trunk show are in USD unless otherwise noted. Ada Diamonds is not responsible for changes in foreign exchange rates and will only charge clients in USD. All purchases delivered in, picked up, or shipped to California addresses are subject to California sales tax at a rate of 8.5%. All purchases delivered in, picked up, or shipped to New York addresses are subject to New York sales tax at a rate of 8.875%. Due to the new Supreme Court ruling affecting internet businesses, your state may require sales tax be collected. Please consult with your Diamond Concierge for additional information. Ready to begin your bespoke piece? Schedule a consultation with an Ada Diamonds Concierge today! Most Delicate Collection and Ready-to-Ship orders ship within 1-2 business days of placing your order. A Diamond Concierge will contact you within 24 hours if your order requires more time to ship. Most Strong Collection orders ship in 1-2 weeks of placing your order. Purchases of loose diamonds are ready to ship in 1-3 business days. A Diamond Concierge will contact you within 24 hours if your order requires more time to ship. Bespoke pieces, including bridal pieces, are ready to ship within 2-3 weeks from final design approval, depending on the complexity of the piece. Most designs are approved within 1-2 weeks from date of deposit placement. Your Diamond Concierge will notify you if your piece requires additional fabrication time. Within the United States, Ada Diamonds offers complimentary, fully-insured two-day shipping with Fedex for pieces up to $15,000 USD in value, and pieces over $15,000 USD are sent complimentary via fully-insured Fedex Priority Overnight when sent to a business or held for pick up at a Fedex Office location. Shipments sent to a residence carry a $50 USD non-refundable fee. Shipments under $15,000 USD in value may be upgraded to Fedex Priority for $50 USD. All shipments require signature upon delivery and may not be left unattended at a residence or business location. It is strongly recommended to have a package sent to a business or Fedex Office location for pick up. It is strongly discouraged to send a shipment to a residence, even a building with a doorman. Unclaimed packages, packages returned to Ada, or packages that must be re-routed to a new address due to client error carry a $40 USD re-shipping fee. If a shipping address is different from the billing address, additional documentation may be required. Ada Diamonds does not deliver to UPS stores. For pieces with a value above $100,000 USD, armored delivery may be required through Brinks or Malca Amit. Signature is required upon delivery. Shipments are fully insured while shipments are in transit and up until the point of signature, at which point liability for loss or theft is transferred to the customer. Ada Diamonds encourages clients to insure fine jewelry using personal jewelry insurance. Ada Diamonds does not guarantee next day or two-day delivery due to Fedex and weather delays. We recommend allowing for two additional business days for time sensitive shipments. A valid phone number is required for all shipments. Please note that some US territories are considered International destinations for shipping purposes. Ada Diamonds will ship any order under $100,000 to an APO, FPO, or DPO address. We ship all APO/FPO orders via USPS Express Mail. For security purposes, USPS will not show a delivery scan or in transit scans for packages sent to these addresses. Most shipments to APO, FPO, or DPO addresses will usually arrive within 7-13 business days. Certain orders however, may take up to 20 business days for delivery. Orders sent to APO, FPO, or DPO addresses are not subject to foreign import fees. International recipients are responsible for paying all customs duties and import fees. Ada Diamonds is not able to provide estimates or quotations of international import fees. For those countries not listed, armored delivery may be available for jewelry purchases of $25,000 or more. Please inquire with an Ada Concierge for more information. Your Diamond Concierge will go above and beyond to ensure you are fully satisfied with your purchase. Should you be unhappy for any reason, Ada Diamonds is proud to honor a full 30-day return and refund policy. To initiate a return, submit a Customer Service Inquiry within 30 days of receipt of Ada merchandise through the website. Merchandise may be returned in person at the San Francisco locations by appointment or during our drop-in hours. Clients will be responsible for shipping, fully insured and double boxed, all returned merchandise back to Ada Diamonds through Fedex or UPS with receipt. Ada Diamonds may provide a return shipping label and deduct the cost of return shipping from a refund. Depending on value, Ada Diamonds may arrange for armored shipment, and will deduct any costs associated from total amount of refund. International clients are responsible for paying for, and fully insuring, return shipments. Any import tariff, taxes, or duties assessed and charged on return of goods to Ada Diamonds will be deducted from total amount of refund. Finished jewelry must be returned in complete, original, out-of-the-box condition, with original grading certificates, if applicable. In other words, pieces worn during the 30-day period are no longer in original condition and are not eligible for return. Loose diamond purchases must be returned with the original grading certificate and in their original condition. 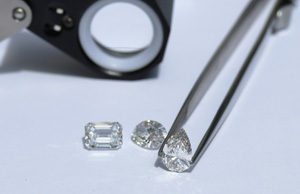 Ada Diamonds will check to ensure both loose diamonds and set diamonds match their corresponding grading certificates. Finished jewelry must be returned in full; Ada Diamonds will not accept partial returns of finished jewelry, such as returning only the setting or only the loose diamond. Clients unsure about setting styles are encouraged to consider Ada Diamonds’ Proposal Setting program. Once your return is received and confirmed, your refund will be processed in 5-7 business days to the original form of payment, when applicable. If necessary, your refund will be provided via check. Ada Diamonds will only provide refunds in the form of USD and cannot refund in other currencies or cryptocurrencies. Returned items are not eligible for immediate re-purchase and must go through an extensive intake process. In other words, if a customer creates a custom setting and wants to “return” the ring then immediately re-purchase the ring in order to avoid re-setting fees, that is not an option. Please see below for re-setting and removal fees. Jewelry that has been worn and is no longer in original, out-of-the-box, new condition is not eligible for refund or return. Any commissioned diamonds are not eligible for refund or return and are considered final sale. Any additional services such as upgraded shipping fees, secondary third-party gemological grading, engraving fees, or re-setting fees are not refundable. Some custom pieces and loose diamond purchases may be ineligible for return and are considered final sale with pre-payment written confirmation and consent from the client. If a client wishes to purchase a lab grown diamond outside of the quality levels approved by Ada Diamonds, or has been advised of potential issues in fabrication of a piece, Ada Diamonds reserves the right to revoke the return policy, so long as this notice has been given prior to a client paying any part of an invoice or deposit. Solitaire engagement rings, as noted by a Diamond Concierge, are eligible for Ada's Proposal Setting policy. Proposal Settings may be returned within 18 months of purchase for re-setting by Ada Diamonds. The entire cost of the original setting may be applied toward the purchase of a new setting. The new setting must be of at least equal or higher value than the original setting. To ensure you love a diamond prior to committing to a full piece of jewelry, we recommend purchasing the lab diamond loose. Subsequent to final payment, Ada Diamonds will ship the diamond to you. You will have 30 days to inspect and decide to keep or return the diamond. If you would like Ada Diamonds to set the diamond for you, you will be provided with a complimentary fully-insured shipping label to return the diamond to complete the custom design process. Should you elect to return the diamond and not set it with Ada Diamonds, you are responsible for return shipping. Please note that loose diamond inspection is limited to one diamond per client and is not a good way to see multiple diamonds in person. Upon placing a 20% deposit, your Concierge will work with you to develop a custom piece of jewelry using computer-aided design and photorealistic renderings. Ada's Concierge and Design team have years of experience creating beautiful, long-lasting jewelry, and will offer guidance and suggestions throughout the process. Ada Diamonds Concierges may also caution against design styles requested by clients for structural and aesthetic reasons, and will alert a client with written notice that the client's requests are ill-advised. Ada Diamonds' 30-day return and refund policy does not extend to re-setting a center diamond into a completely new design, should the client change his/her mind about his/her preferences for the setting. Should you decide to forego the setting after production, and the ring is in original, out-of-the-box condition, the client can receive full credit for a returned setting, less a removal fee starting at $500 USD (client will receive a custom quote to remove the center stone). Client is responsible for return shipping. If a client has been wearing the ring for some time and has decided that he/she no longer likes the setting, that piece is not eligible for a removal refund. Ada Diamonds would be happy to design and create a new setting starting at $500 USD (client will receive a custom quote to re-set the diamond into a new setting). Due to the bespoke nature of our work, Ada Diamonds does not sell loose mountings or settings. Due to our jewelry warranty, Ada Diamonds will not set outside gemstones of any kind. From time to time, an engagement or wedding ring purchased from Ada may need to be re-sized. SF bay area residents are welcome to drop off a ring for re-sizing at our San Francisco location at no charge. For those outside of the SF bay area, a re-sizing fee of $50 USD will be required, which covers fully-insured shipping both ways. In the event a ring must be completely re-cast due to significant incorrect ring size (2+ sizes), a re-setting fee will be charged, starting at $500 USD. Strong Collection rings must be exchanged for a different size ring within 30 days of receipt. Eternity bands, and those rings for which a Concierge has provided pre-payment notice of inability to re-size, are ineligible for complimentary re-sizing and will require full exchange within 30 days. Due to the bespoke nature of Ada's eternity bands, re-stocking fees for eternity bands are quoted on a case by case basis and start at $400 USD. Please note that all Strong Collection and Eternity Band exchanges that require different sizes will NOT be the same ring, but rather will be a replacement ring. Those looking to ensure the ring included in their nuptial ceremony remain their eternal rings are encouraged to consider non-Strong Collection and non-eternity bands that can be re-sized rather than replaced. Ada's diamonds are the hardest substance on earth — ten times harder than a Sapphire or Ruby. A 10 out of 10 on the Mohs hardness scale, Ada diamonds are extraordinarily resistant to heat, chemicals, and scratching. Furthermore, lab grown diamonds are less likely to chip than mined diamonds since they have less strain, defects, and impurities in their crystal structure. Because of their quality, we guarantee that diamonds purchased from Ada will not fade, cloud, change color, or lose their brilliance in your lifetime. If, at any time, your Ada diamond loses its optical quality after purchase, your diamond will be eligible for trade-in for a diamond of comparable size and quality. There is no additional fee for this warranty. Ada Diamonds reserves the right to waive this warranty with advanced pre-payment warning to a client for any commissioned stones cut to specifications not recommended by Ada Diamonds (such as stones too narrow or too shallow for quality fabrication). There are many simple, low-cost tools on the market designed to differentiate mined diamonds from diamond simulants such as cubic zirconia, moissanite, white topaz, and yttrium aluminum garnet (YAG). Many of these cheap tools (some as little as $10 USD) are not able to properly identify laboratory-grown diamonds, due to the superior quality and purity of a laboratory-grown diamond. While most tools will identify an Ada diamond as a diamond, some tools may incorrectly identify an Ada diamond as a diamond simulant. As such, Ada Diamonds does not guarantee that every handheld tool on the market will correctly identify every lab diamond sold by Ada Diamonds. Ada Diamonds does guarantee that every lab diamond we sell will test as a lab grown or synthetic diamond via a third party gemological association such as IGI, GIA, or GCAL which utilize sophisticated, spectral analysis equipment for testing. Read more about why some diamond testers incorrectly identify laboratory-grown diamonds. Ada Diamonds is proud to offer a warranty on its jewelry. Within the first two years of purchase, we will replace side or accent diamonds (of 0.25ct and smaller) that go missing if due to a manufacturing defect at no cost to the client. Ada Diamonds will examine any jewelry missing stones and make a determination regarding the nature of a missing side stone. Our warranty excludes coverage due to negligence. Should Ada Diamonds determine the repair needed is outside of the warranty coverage or time frame, Ada Diamonds is happy to provide a quote for paid repair. Any repairs or work not done by Ada Diamonds or authorized third parties we work with will void this warranty. We cannot stress enough the importance in choosing jewelry that is appropriate for your lifestyle. Ada Diamonds jewelry is made with precious metals of gold or platinum. These metals are not impervious to breakage or damage. If you are unsure about when and where to enjoy your fine jewelry, an Ada Diamonds Concierge would be happy to walk through some best practices for ensuring the longevity of your ring. Ada Diamonds does not guarantee replacement for a lost center stone for any reason, and strongly encourages our clients to obtain jewelry insurance in the event of extreme damage, loss, or theft. Please note that all of Ada Diamonds bridal jewelry is stamped with both the metal type and Ada's name and/or logo for FTC compliance. SF Bay Area residents are welcome to drop off Ada Diamonds jewelry for complimentary cleaning and re-plating at the San Francisco location. Same day service may be available. For those outside of the bay area, Ada offers cleaning and/or re-plating for $50 USD. This fee only covers the cost of fully insured shipping both ways; the actual service is complimentary. Ada Diamonds is proud to offer a lifetime diamond upgrade program on all IGI, EGL, GCAL, and GIA graded diamonds previously purchased from Ada Diamonds. The price of your new diamond must be at least 1.5x the price of your original diamond. Lifetime trade-in does not apply to the cost of the setting. To begin the trade-in process, please submit a Customer Service Inquiry. This agreement (hereinafter, the "Agreement") between Ada Diamonds, Inc. (hereinafter "ADI" "us" or "we") and you sets forth the terms and conditions which govern your use of any of the ADI or ADI sponsored websites (hereinafter, the "Sites") and/or the services (hereinafter, the "Services") thereon which are provided by ADI. PLEASE READ THIS AGREEMENT CAREFULLY BEFORE ACCESSING OR USING ANY OF THE SITES AND/OR SERVICES. BY ACCESSING OR USING THE SITES AND/OR SERVICES, YOU AGREE TO BE BOUND BY THE TERMS AND CONDITIONS SET FORTH BELOW. IF YOU DO NOT WISH TO BE BOUND BY THESE TERMS AND CONDITIONS, YOU MAY NOT ACCESS OR USE THE SITES OR SERVICES AND SHOULD IMMEDIATELY CEASE SUCH USE. ADI MAY MODIFY THIS AGREEMENT AT ANY TIME, AND SUCH MODIFICATIONS SHALL BE EFFECTIVE IMMEDIATELY UPON NOTICE, WHICH MAY BE ACCOMPLISHED BY POSTING THE MODIFIED AGREEMENT ON THE SITE OR VIA EMAIL. YOUR USE OF ANY OF THE SITES AND/OR SERVICES FOLLOWING SUCH NOTICE SHALL BE DEEMED YOUR ACCEPTANCE OF SUCH CHANGES. YOU AGREE TO REVIEW THE AGREEMENT PERIODICALLY TO BE AWARE OF SUCH MODIFICATIONS AND YOUR CONTINUED ACCESS OR USE OF THE SITE AND/OR THE SERVICES SHALL BE DEEMED YOUR CONCLUSIVE ACCEPTANCE OF THE MODIFIED AGREEMENT. IF WE REQUEST, YOU IRREVOCABLY AGREE TO SIGN A NON-ELECTRONIC VERSION OF THIS AGREEMENT. Certain products or Services may be offered for sale on the Site. In the event you wish to purchase any of these products, you will be asked by ADI or an authorized third party to supply certain information, including without limitation, your full name, address, telephone number and credit card or bank information. You agree to provide ADI or such third party with the foregoing information as well as any other mandatory information that is accurate, complete and current, and to comply with the terms and conditions of any agreement that you may enter into governing your purchase of the product or Service. You shall be responsible for all charges incurred through your account as well as for paying any applicable taxes. The links on the Site and/or Services will let you leave the particular Site or Service you are accessing in order to access a linked site (the "Linked Sites"). ADI provides these links as a convenience, but we neither control nor endorse these Linked Sites, nor has ADI reviewed or approved the content which appears on the Linked Sites. ADI is not responsible for the legality, accuracy or inappropriate nature of any content, advertising, products or other materials on or available from any Linked Sites. You acknowledge and agree that ADI shall not be responsible or liable, directly or indirectly, for any damage or loss caused or alleged to be caused by or in connection with the use of any of the links, content, goods or services available on or through the Linked Sites. All gemstones offered by ADI are proudly grown in a laboratory and are not of natural, mined origin. Your participation, correspondence or business dealings with any third party found on or through our Sites and Services, regarding payment and delivery of specific goods and services, and any other terms, conditions, representations or warranties associated with such dealings, are solely between you and such third party. You agree that ADI shall not be responsible or liable for any loss, damage, or other matters of any sort incurred as the result of such dealings. You acknowledge and agree that the Site and Services contain proprietary and confidential information that is protected by applicable intellectual property and other laws, and are the sole property of ADI or its licensors. You further acknowledge and agree that any content contained in advertisements or information presented to you through advertisers concerning ADI or otherwise is protected by copyrights, trademarks, service marks, patents or other proprietary rights and laws. By sending or transmitting to us creative suggestions, ideas, notes, concepts, information, or other materials (collectively, "Submission Materials") or by posting such Submission Materials on the Sites, you hereby grant to us and our designees a worldwide, non-exclusive, sublicensable (through multiple tiers), assignable, royalty-free, perpetual, irrevocable right to use, reproduce, distribute (through multiple tiers), create derivative works of, publicly perform, publicly display, digitally perform, make, have made, sell, offer for sale and import such Submission Materials in any media now known or hereafter devised, for any purpose whatsoever, commercial or otherwise, without compensation to you, the provider of the Submission Materials. The foregoing license to ADI shall be fully paid-up and royalty free. In addition, under no circumstances shall ADI have any obligation whatsoever to pay a fee to any subscriber or user in connection with the Submission Materials upon the occurrence of a transfer of all or any portion of ADI business through a merger, sale or transfer of all or substantially all of the assets of Ada, nor shall the sale of advertising on any of the Sites give rise to any obligation to pay a fee to Subscribers. None of the Submission Materials disclosed or posted via message boards, chats or other public forums shall be subject to any obligation, whether of confidentiality, attribution, or otherwise, on ADI's part and we shall not be liable for any use or disclosure of any such Submission Materials. As part of ADI's ongoing marketing efforts, media of your piece of fine jewelry, including videos and images, may be used and shared without limitation through multiple forms of marketing including, but not limited to web site content, social media sites, advertisements, printed materials, and others, as well as shared individually with other clients as examples of ADI's past work. ADI and its employees, to the best of their abilities, will take care to not share sensitive client information such as client names or invoice amounts with anyone outside of the ADI organization. ADI understands the seriousness of discretion of clients purchasing an engagement ring and will take care within reason to only share media on public social media sites after a client's proposal or after four months have passed, whichever is sooner. This Agreement shall remain effective until terminated in accordance with its own terms and conditions. You agree that ADI, in its sole discretion, may terminate your password, account (in whole or in part), or use of the Site or Services, and remove and discard any content within the Site, at any time and for any reason. You agree that any actions taken under this Section 19 may be effective without prior notice to you. In the event of termination, however, those Sections in this Agreement which provide for continuing obligations on your part shall survive indefinitely. You agree to indemnify, defend, and hold ADI and its subsidiaries, affiliates, officers, directors, agents, co-branders or other partners, employees, and representatives harmless from and against any and all claims, damages, losses, costs or expenses (including reasonable attorneys' fees and disbursements) which arise directly or indirectly out of or from (i) your breach of this Agreement, (ii) any allegation that any materials that you submit to ADI or post on any forums (e.g., message boards, chat rooms) infringe or otherwise violate the copyright, trade secret, trademark or other intellectual property rights of a third party, and (iii) your access or use of the Site and/or the Services. This Section 17 shall survive in the event this Agreement is terminated for any reason. The Digital Millennium Copyright Act of 1998 (the "DMCA") provides recourse for copyright owners who believe that material appearing on the Internet infringes their rights under the U.S. copyright law. If you believe in good faith that materials hosted by ADI infringe your copyright, you, or your agent may send to ADI a notice requesting that the material be removed or access to it be blocked. Any notification by a copyright owner or a person authorized to act on its behalf that fails to comply with requirements of the DMCA shall not be considered sufficient notice and shall not be deemed to confer upon Ada actual knowledge of facts or circumstances from which infringing material or acts are evident. If you believe in good faith that a notice of copyright infringement has been wrongly filed against you, the DMCA permits you to send to Ada a counter-notice. All notices and counter notices must meet the then current statutory requirements imposed by the DMCA; see http://www.loc.gov/copyright for details. We suggest that you consult your legal advisor before filing a notice or counter-notice. Also, be aware that there can be penalties for false claims under the DMCA. Ada Diamonds has a zero tolerance policy for harassment or abuse of our employees. By agreeing to our Terms, you acknowledge that ADI may at any time, without notice, refuse service to any customer who is aggressive or belligerent, or who harasses or makes threatening statements towards any employee of ADI at any time. Should a client be refused service, he/she will be immediately refunded and his/her order canceled. EU data protection law makes a distinction between organizations that process personal data for their own purposes (known as “controllers”) and organizations that process personal data on behalf of other organizations (known as “processors”). ADI, located at the address in the section entitled “Contact Us” below, is the controller with respect to information you provide through the Service. Content. We collect the content of messages you send to us, such as feedback and product reviews you write, or questions and information you provide to customer support. For example, if you contact a customer service representative or jewelry consultant and provide information to the consultant or submit a request through our Service, we will use your information to respond to your request and to provide you with additional information that we believe may be helpful to you. IP Address and Device Identifiers. ADI collects your IP address and other device identifiers, including your MAC address and mobile advertising identifiers. We collect this data for various purposes, including to assess, diagnose problems, and improve functioning of our Service, servers, and hosting providers as well as to analyze trends and traffic patterns, gather demographic information, track the date, time, and duration of each session within our website, prevent fraud, and customize our services and advertisements. Web Beacons. ADI also uses electronic images known as web beacons (also known as pixels) on the Service. When you access a website, video, e-mail, or advertisement that contains a pixel, the pixel may permit us or a third party to drop or read cookies on your browser. Pixels are used in combination with cookies to track activity by a particular browser on a particular device. We may incorporate pixels from third parties that allow us track our conversions, bring you advertising both on and off the Service, and provide you with additional functionality, such as the ability to connect our Service with your social media account. Social networks when you reference our Service or grant permission to ADI to access your data on one or more of these services. Service Providers. We share your information with third party agents, contractors, vendors, and other service providers in connection with their work on our behalf (collectively “Service Providers”). For example, if we need to ship something to you, we must share your name and address with a shipping company. Examples of other third parties that we may share your information with include: webhosting companies, fulfillment companies (e.g., companies that fulfill product orders), loose diamond suppliers, jewelers, assemblers, data analysis firms, affiliates, third party consulting or marketing firms, and e-mail service providers. Additionally, if you use a credit card or other financing alternative to place an order with ADI, we will use a third party payment processor to process your information in association with the transaction. We may also may share information with other companies and organizations for credit fraud protection and risk reduction. These third parties only receive your information if such information is needed to perform their function(s), and they are not authorized to use such information for any other purpose(s) other than the purpose(s) set forth by ADI. We only provide third-parties with the minimum amount of information necessary to complete the requested service, product or transaction. Notwithstanding the above, we may permit our Service Providers to use aggregate information which does not identify you or de-identified data for other purposes. Special Events: If you choose to participate in a special event (for example, a Promotion), ADI may share your information with those organizations participating in the applicable event. Typically, these third parties do not use your information for any other purpose other than to manage the event. In some cases these third-party partners may send you promotional materials regarding their products and services. In these cases, you will be given the opportunity to opt-out, and not have your information shared with that third-party partner. By entering a Promotion, you agree to the official rules that govern that Promotion, and may, except where prohibited by applicable law, allow the sponsor and/or other parties to use your name, voice and/or likeness in advertising or marketing materials. Feedback and Testimonials. If you provide feedback or testimonials on the Service or on ADI products or services, we may post this feedback or testimonial, including your information, on the Service or in marketing and promotional materials. We may, by our sole discretion, edit feedback or testimonials for length and content. California residents and data subjects in Europe have additional rights as set forth in “Your Rights and Choices” below. Business Transfer. Your information may be disclosed as part of, or in connection with, any merger, sale of company assets, or acquisition, as well as in the event of an insolvency, bankruptcy or receivership, in which information would be transferred as one of the business assets of ADI. ADI does not knowingly collect personal information from children under the age of thirteen (13). In the event that ADI ever does so, we will strictly comply with the Children's Online Privacy Protection Act (“COPPA”). If you are a parent or guardian and believe ADI has collected such information in a manner not permitted by COPPA, please contact us as set forth in the section entitled “Contact Us” below, and we will remove such data to the extent required by COPPA. Liking and Sharing. We may embed a pixel or SDK on our Service that allows you to “like” or “share” content on your ADI account through, Third Party Services, including social networks such as Facebook and Twitter. If you choose to engage with such a Third Party Service through our Service, we may collect any information you have authorized the Third Party Service to share with us (such as your user ID, billing information, public profile information, e-mail address, birthday, friends list, and other account and profile data). Likewise, if you choose to engage with such a Third Party Service through our Service or visit our Service while logged in to that Third Party Service on your device, the Third Party Service may receive information about your activities on our Service and be able to associate that information with information the Third Party Service already has about you. To opt-out of receiving e-mail promotions from ADI, please follow the unsubscribe instructions in our promotional e-mail correspondence or contact us as set forth in the section entitled “Contact Us” below. Please note that opting out of promotional communication received from ADI does not affect our non-promotional communications with you, including those related to your account, orders placed with ADI, or our ongoing business relations. If you are a customer in California, in addition to the rights set forth above, you have the right to request information from ADI regarding the manner in which ADI shares certain categories of personal information as defined by California’s “Shine the Light” with third parties and/or affiliates for their own direct marketing purposes. To receive this information, send us a request at the address set forth in the section entitled “Contact Us” below. Requests must include “California Privacy Rights Request” in the first line of the description and include your name, street address, city, state, and ZIP code. Please note that ADI may provide this information in a standardized format that is not specific to you and is not required to respond to requests made by means other than through the provided e-mail address or mail address.